REGISTER BY MAY 15 and pay last year’s price! TCC Camp - August 19-23 9:00-4:00 for children who will be entering grades 4-9 in the fall. Click the registration link for more information. TCC Junior will be a training chorus for children in grades k-3. Activities during rehearsal will focus on developing good vocal technique, intonation, rhythm skills, and beginning music literacy. Songs, games, and folk dances will all be part of the rehearsal. Unison and beginning part singing will be explored. The chorus will perform on their own as well as with the Troy Children's Chorus. TCC receives a grant of $5,000 from The Arts Center of the Capital Region for "Songs of Peace and Love" and 2016 series of community concerts. This project is made possible with funds from the Decentralization Program, a regrant program of the New York State Council on the Arts with the support of Governor Andrew Cuomo and the New York State Legislature and administered by the Arts Center of the Capital Region. TCC receives a grant of $5,000 from The Arts Center of the Capital Region for "One World, One Voice" and 2017 series of community concerts. This project is made possible with funds from the Decentralization Program, a regrant program of the New York State Council on the Arts with the support of Governor Andrew Cuomo and the New York State Legislature and administered by the Arts Center of the Capital Region. • Emphasis is placed on the enjoyment of music, proper singing technique, and the development of music reading skills. •Troy Children's Chorus rehearses Tuesdays from 4:30 to 5:45 p.m. and holds one extended rehearsal each semester on a Saturday from 9:00-1:00. • Sings for Civic/Community events in the area (Victorian Stroll, Troy Night Out, etc. ), as well as for libraries, nursing homes, etc. • Sings twice annually for First United Presbyterian Church as compensation for use of facilities, personnel, etc. The mission of the Troy Children's Chorus is to engage each chorister in high-quality music education with the aim of producing the finest choral experience in the spirit of non-violence, respect, diversity and peace. The 2018-2019 choral season runs from September 18, 2018 through May 2019. The first three rehearsals of each semester are open anyone interested in trying us out..
Fall: $20 one-time dress uniform fee. Spring: $20 casual uniform fee. 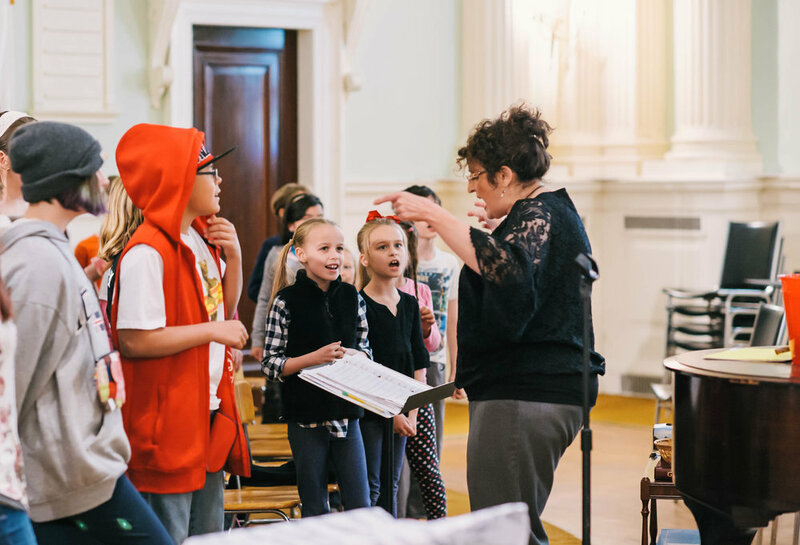 Our vision is to offer the inclusive and accessible art form of choral singing to any child, in grades k-9, who is open to learning, working together and being a part of a diverse group of children. The TCC also aspires to engage all members of the community in the joy-filled, hopeful spirit of our children's free choral performances. Within the 2018-2019 season, we have a Fall session and Spring session. The chorus rehearses on Tuesdays from September 18, 2018-May 2019 with a winter break in late December. The Chorus also rehearses on two Saturdays during the season: once in each semester. "We appreciated the balance of learning music, having fun, and learning to work as a member of a greater whole. We appreciated the emphasis on discipline and respect within the program." "The chorus is educational and fun. The staff interacted in a professional manner with choristers and parents. My daughter loved going each week." "There is a really nice variety of songs selected. There is a nice balance of discipline and rigor with a fun social aspect." All young people in grades K-3 and 4-9, with unchanged voices, are welcome in our community children's choruses. No singer will be turned away because of financial hardship. We are a unique organization, equally dedicated to creating beautiful music as we are to making the world a better place. Few things are more beautiful than children's voices lifted in harmony. We hope you will join us and help us spread the joy that music brings! Troy Children's Chorus -Tuesdays, January 8, 15, and 22. Come check out a rehearsal to see if it's for you. No audition necessary. Since its inception in 2010, Troy Children’s Chorus has been a purely positive piece of our community. We believe Troy Children’s Chorus helps to make our city stand apart! As supporters of Troy’s diverse community, we invite you to share in the patronage of Troy Children’s Chorus. Troy Children’s Chorus is a 501 (c)(3) non-profit, choral group for children in grades 2-9. We receive partial support from grants like the Community Arts Grant through the Art Center of the Capital Region, individual donations, and minimal tuition fees. We also have the support of the First United Presbyterian Church through their generous donation of rehearsal and performance space and the countless volunteer hours of the parents during each season. Thank you in advance for your generous support! Tax deductible donations can be made to Troy Children’s Chorus and mailed to: TCC in residence at First United Presbyterian Church, 1915 5th Ave, Troy NY 12180 or to our PayPal account below.